The Mongrel was born in 1947, which was from then on known as the year of “The Foul Mouthed Mongrel”. He was born in Ferryden Park. Went to Croydon Primary and won many elephant stamps for elementary swearing. Wayne transferred to Christian Brothers College where he became very popular with a group of hard drinking, hard swearing priests who shoved his head down the toilet bowl many times. Never popular with the older priests because he told them where to go, he left after only a short stay. Apprenticed to a Light Square Printer he was made a Binder because he got the lowest ever score in the IQ Test. But he flourished as a “paper cutter” and joined the Government Printing Office in 1973. His career as a “The Mongrel” really took off at Netley and soon bosses ran away from him in terror and women averted their eyes and wore ear plugs. He was a Legend for all the wrong reasons. His hobbies included vigorous mixed basketball and watching his three little Catholic boys play sport. He married a beautiful and talkative Catholic nurse called Angela and finally settled in South Plympton, not far from his “special” friend Russell. He started following Westies when they won the SANFL Grand final in 1983 then ditched them when Port Power went top in the AFL. He is therefore not a loyal person. But it is his Gift to the English Language that has made him a Legend. He has enriched our Culture with some of the most poetical and colourful filthy Language imaginable. “Mongrel” you are a Legend! 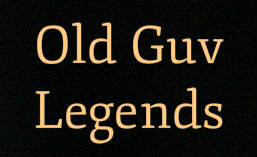 This entry was posted in OGL STORIES and tagged Legend. Bookmark the permalink. ← Derwombat’s Blog – 12 April 2019. That would be Wayne Brown! !